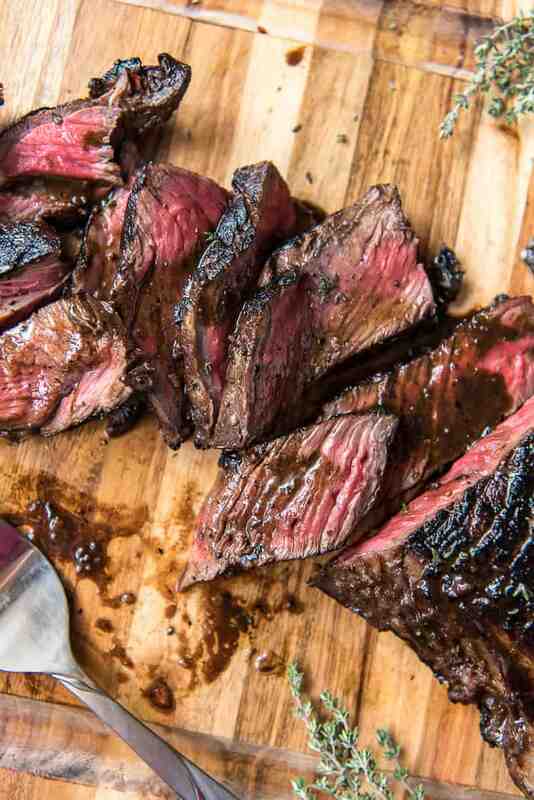 The secret to this insanely flavorful and tender Marinated London Broil is all in the timing! A day’s worth of soaking in a simple balsamic-wine marinade rewards you with a delicious dinner that’s versatile and ready in no time. I have no idea why I haven’t shared my London Broil with you guys yet. After almost 5 years into blogging, there’s definitely not enough beef in my recipe archives. And since this is something I make pretty often…I’m not sure why I’ve held back on you. I decided last fall that 2019 would be The Year Of Dinner Recipes, since two reader surveys told me that’s what you guys are mostly here for. I’d like to think I’m off to a pretty good start. 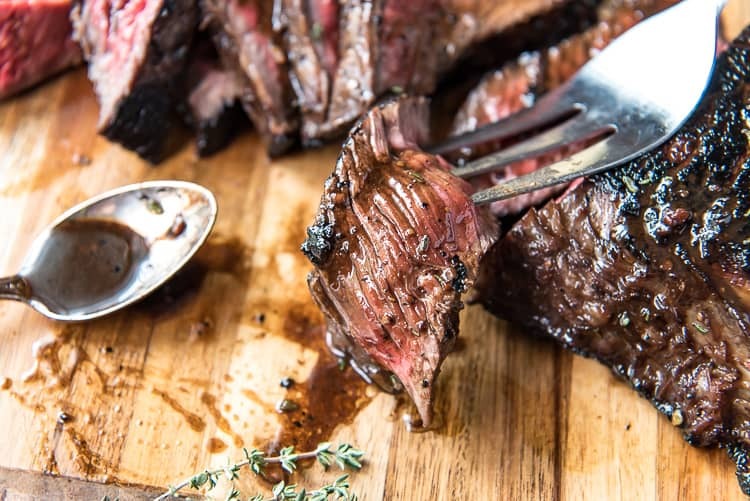 This insanely delicious steak recipe is a must-make! 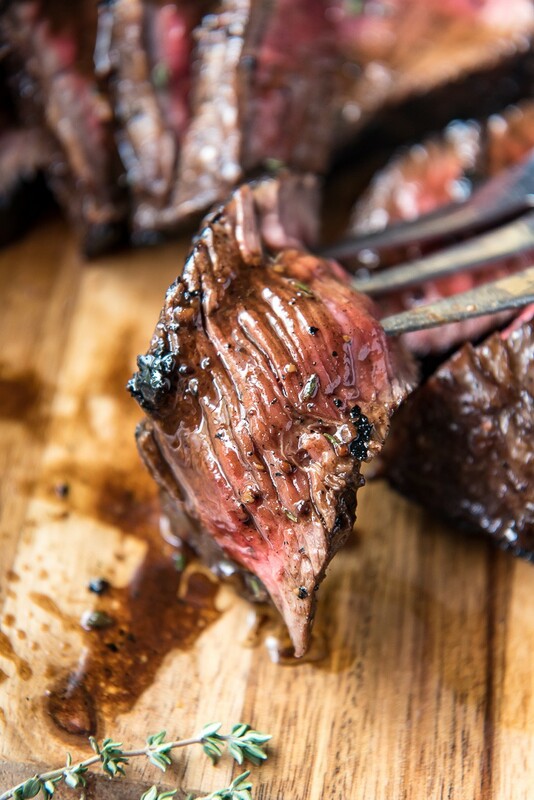 It’s SUPER tender, full of flavor, and there is zero waste, since you reduce the London broil marinade into a serving sauce! All it takes is a little patience during marinating time, a cast iron skillet, and a hot stove. JUST TAKE ME TO THE LONDON BROIL ALREADY! 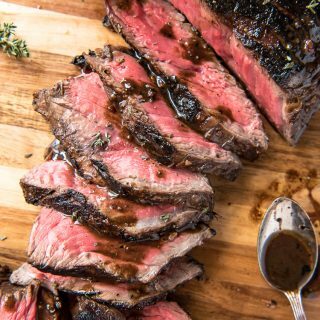 If you’d rather skip my (pretty darn helpful) tips and tricks, essential cooking info, and similar recipe ideas – and get straight to this deliciously easy London broil recipe, just scroll right on down to the bottom of the page where you can find the printable recipe card! 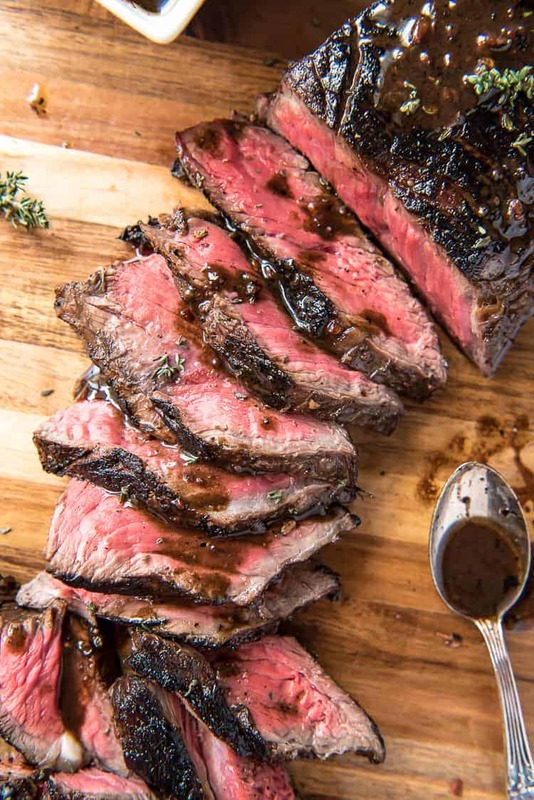 I love sharing recipes like this London broil, because I get to make my hubby work – he gets to answer my questions for me. Well…in spite of what the labels at the store say, there is no London broil cut. “London Broil” is actually a cooking method, and one that has roots in America instead of across the pond. It refers to tough, lean , inexpensive cuts of beef that are marinated and seared, grilled, or broiled at a high heat. London Broil should never be tough. If it is, it was not marinated properly or for a long enough time. Quickly cooking lean steak often results in tough, chewy beef (I’ve made this mistake with fajitas.) The longer you marinate your beef, the more tender it will be. 24 hours is ideal, so if you can get away with it, plan far ahead for dinner! As for which beef cuts to look for, flank steak and top round steak are both cut from the rear part of the cow and work well for any London Broil-labeled recipe. Try to find the thickest cut possible, also – 2-inches thick makes for an ideal slice! 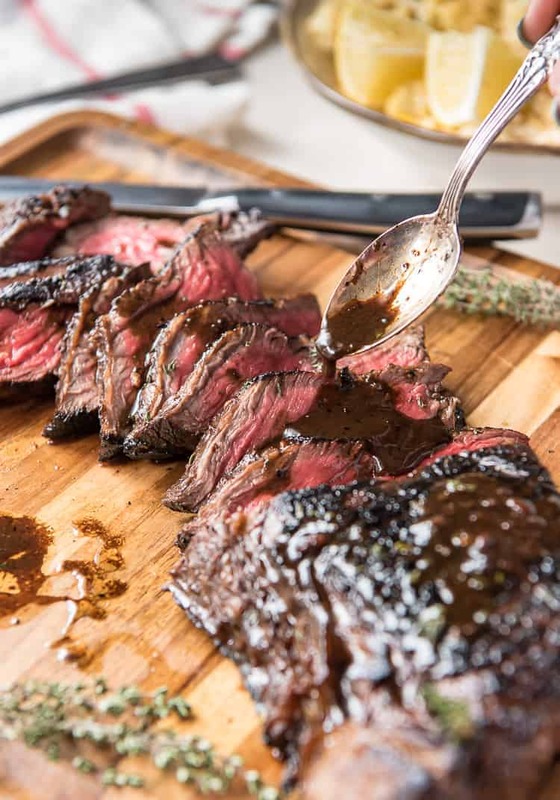 What Goes In A Delicious London Broil Marinade? Everyone has their tastes, from herb heavy to soy-based. I’m a red wine & balsamic fan, so I like to balance my marinade around those flavors. Fresh garlic – it MUST be fresh! What Temperature Should London Broil Be Before Serving? Depending on your tastes, you can cook your steak for more or slightly less time than I do. I’m pretty partial to some sort of starch and veggie with any kind of steak. Mashed Potatoes or Baked Potatoes are a good choice, but Mushroom Risotto or Baked Macaroni & Cheese would be equally delish. As for veggies, a tasty salad is a no-brainer. Complement the marinade with Red Wine & Maple Carrots and Bacon Balsamic Brussels Spouts. If you love bread with your hearty meals, my Purple Potato Rolls are a fun, convo-starting side! First, make your marinade. Whisk together marinade ingredients in a small bowl until well combined. Place the London Broil steak in a gallon-sized zipper bag and pour the marinade over it. Seal the bag, removing excess air, and place it in the refrigerator. Allow it to marinate for at least 12 hours and up to 24, turning the bag at least once. Two hours before cooking, remove the steak from marinade and place it on a cutting board. Reserve the marinade, placing it back in the fridge while you allow the steak to come to room temperature, 1-2 hours. When you’re ready to cook, use a sharp knife to score a shallow, 1/8-inch deep criss-cross pattern on both the top and bottom of the steak. Melt butter and oil in a large cast iron skillet set over high heat until it sizzles. Sear the steak for 3 minutes, undisturbed, then flip and repeat on the opposite side. Then, remove the pan from the heat and tent it with foil. Leave it to continue cooking in the residual heat of the pan to your desired doneness, anywhere from 5-10 minutes. Use a thermometer to check the temperature; 120-130 degrees F is rare, while 130-135 degrees F is medium rare. When the steak reaches your desired temperature, transfer it to a cutting board to rest for 10 minutes. Carefully pour the reserved marinade in the same pan and return it to the stove. Bring it to a boil over medium heat, then reduce to medium low, stirring occasionally, and cook until the marinade is reduced by half. Slice the rested meat thinly, diagonally across the grain, and serve it with the reduced sauce. 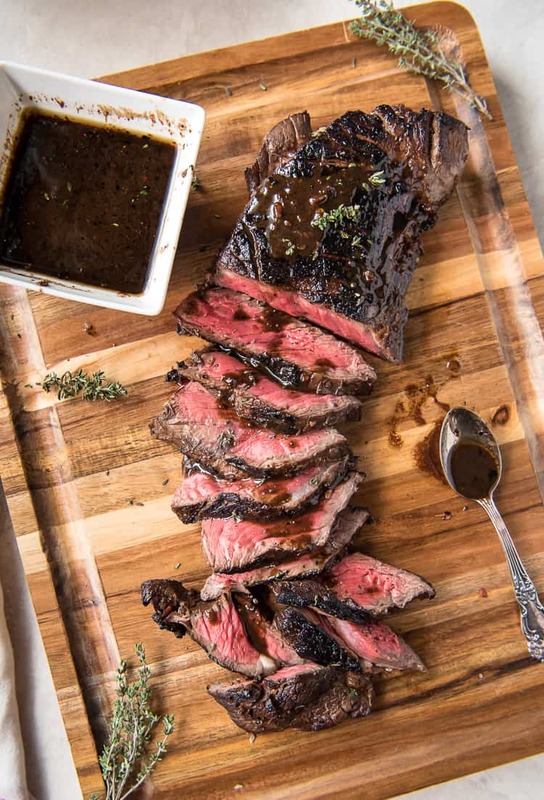 The secret to this insanely flavorful and tender Marinated London Broil is all in the timing! A day's worth of soaking in a simple balsamic-wine marinade rewards you with a delicious dinner that's versatile and ready in no time. In a small bowl, whisk together marinade ingredients until well combined. Place steak in a large plastic zipper bag and pour marinade over it. Seal bag, pressing out excess air, and place in the refrigerator. Marinate at least 12 hours or overnight, turning the bag at least once. 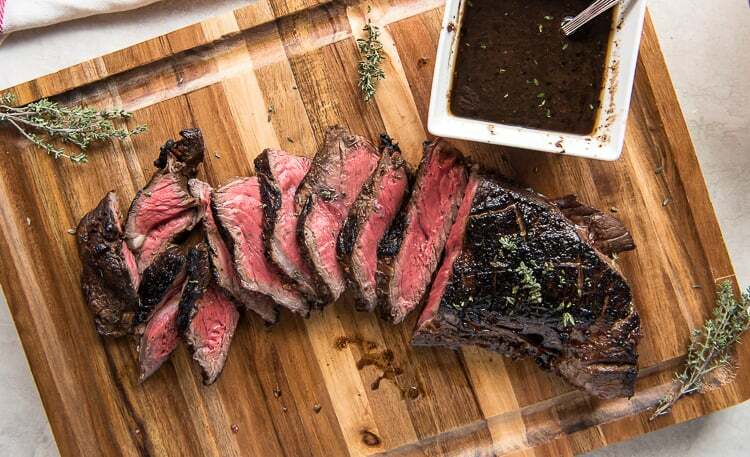 Remove steak from marinade (reserving the marinade in the fridge) and place it on a cutting board. Allow it to come to room temperature, 1-2 hours. With a sharp knife, score a shallow, 1/8-inch deep criss-cross pattern on both the top and bottom of the steak. Melt butter and oil in a large cast iron skillet set over high heat until sizzling. Sear the steak for 3 minutes, undisturbed, then flip and repeat on the opposite side. Remove the pan from the heat and tent it with foil. Leave it to continue cooking in the residual heat of the pan to your desired doneness, 5-10 minutes, using a thermometer to check the temperature. 120-130 degrees F is rare, while 130-135 degrees F is medium rare. Transfer steak to a cutting board to rest for 10 minutes. Carefully pour the reserved marinade in the same pan and return it to the stove. Bring to a boil over medium heat, then reduce to medium low, stirring occasionally, and cook until the marinade is reduced by half. Slice rested meat thinly, diagonally across the grain, and serve with the reduced sauce. PIN THIS LONDON BROIL RECIPE FOR LATER!